Milan 2015: Spanish designer Jaime Hayón has created a range of wooden tables that are shaped to look like the curved structural elements of iconic buildings by Le Corbusier. Hayón designed the Réaction Poétique collection for Italian furniture brand Cassina to commemorate 50 years since the death of the seminal Modernist architect. The shapes used in the range of wooden tables reference the organic forms of Le Corbusier's structures, which include the Ronchamp Chapel in France and the government buildings at the Indian city of Chandigarh. "I wanted to create useful objects for the modern home such as trays and side tables, but with sculptural elements interplaying forms, light and shadow," said Hayón. His designs include a set of tables with circular tops that are gently curved underneath. The surfaces stand on chunky rounded bases, which feature protrusions and holes on their sides. A cross is mounted onto the largest design, while a smaller two-tiered piece is topped with a thick rounded handle for lifting. A low kidney-bean-shaped table sits on seven cylindrical posts. Its piloti-like supports measure various diameters and pop up through the curved horizontal surface, extending to different heights. The collection is completed by two circular trays, each balanced on three small feet and featuring a double-sided handle at the top of a tapered central pole. 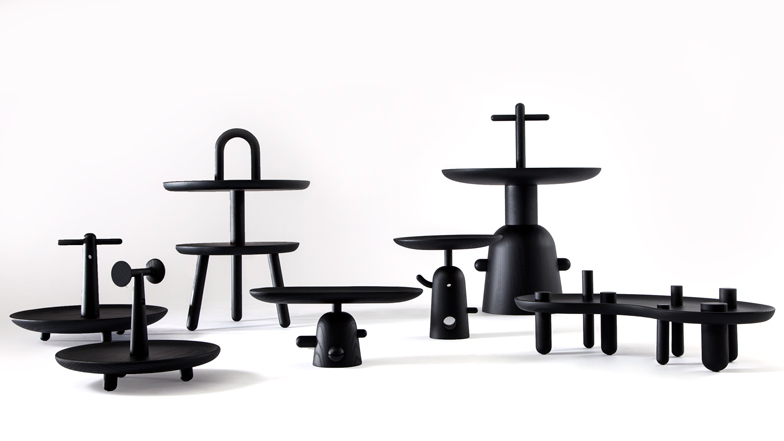 All the pieces are made from solid ash, stained black with a low-gloss finish, and are hand-carved by Cassina's carpenters. "It was a very strict, almost religious challenge to use only one material and one finish, exercising my design philosophy," Hayón said. "I feel this restriction actually became an opportunity to showcase the beauty of the wood." Cassina will present the range at the Salone del Mobile furniture fair in Milan from 14 to 19 April – Hall 20, Stand D01-E06. The brand is also showing a documentary titled Le Corbusier 50, Stories of Encounters that have Revolutionised Design at the adjacent stand.